BARE-knuckle boxing is not a sport often associated with the legal profession, but an aspiring Colwyn Bay solicitor is doing his utmost to find a common ground. Seth Jones, aged 46, has been thrust into the limelight following his appearance in a new documentary featured on Vice.com, which looks at how the sport is trying to break out of its underground surroundings. In his younger years, Jones was just another promising professional boxer whose fledgling career was curtailed by injury - and involvement with crime. After serving time behind bars for smuggling class B drugs, the father-of-six found a new lease of life following his release and opted to take up a law access course at Coleg Llandrillo. Seth said: “I was a pro boxer, I had quite a lot of injuries and didn’t really have anything else going for on so I got into the wrong side of life. “Over the last five years I’ve been aiming to re-build myself. I’m back now to where I should have been all along. "My life’s really come right round on itself." Along with planning to take his final legal practicioner's course, Seth now spends some of his time as a boxing trainer at Old Colwyn’s Immortals Gym and Bangor University Boxing Club, which he helped set up two and a half years ago. But it is inside the ring where he still finds his biggest thrills. After being introduced to Andy Topliffe two years ago, the man behind up-and-coming British bare knuckle boxing organisation B/BAD Promotions, Seth was soon back to doing what he loves most - fighting. Seth said: “I spoke to Andy and he said the aim of B/BAD is to legitimise the sport and take it away from the underground. “The whole philosophy of legitimising the sport is why I stepped in and gave Andy some help. "It wasn’t an illegal sport, it just needed some sanctions in place like boxing and mixed martial arts. “Andy offered me a fight a couple of years ago and I took it. Known in the B/BAD scene as the “Bangor Hammer”, Seth has developed a fearsome reputation and he now relishes his next bout - often against opponents 20 years his junior. Seth also uses his new-found legal expertise to help with licensing fights across the UK. “It’s just certain aspects that needed changing.” said Seth. “Now it’s refereed and controlled. There’s been no serious injuries so far, just a few bumps and bruises but that’s the nature of the job. Promoters of a postponed ‘bare-knuckle’ boxing match are hoping to restage the event within months once licence and planning obstacles have been overcome. The nine-bout card, featuring two UK title fights,was due to take place on Saturday at Hinckley’s Leicester Road Stadium but was cancelled following intervention by the borough council and police. Discussions revealed the venue didn’t have the correct permissions to host the match, organised by former publican and pugilist, Andy Topliffe of B-BAD Promotions. Commercial bosses at Leicester Road are now seeking the proper approvals with a view to the event being resurrected within 12 to 15 weeks. Punters who have already bought tickets can request a refund or receive a voucher for entry to the reorganised match. Around 1,000 fans were due to turn up had the event gone ahead. Andy, who is keen to try and legitimise the sport and bring it to a more mainstream audience, said: “Obviously this is a huge disappointment but at the same time a victory because at least now we know we can work with the police and local council and hold another event. Bare Knuckle Boxing is illegal in the UK as it is unregulated and associated mainly with dust-ups on travellers’ sites. In early discussions with the police Andy had agreed the fighters should all wear 4 oz, gloves, the smallest available which are used in Mixed Martial Arts - M.M.A. The hitch was Leicester Road Stadium doesn’t have a licence to put on MMA matches and it transpired planning permission was also required for the ring to be set up on the pitch. Andy, 38, who ran The Loft in Hinckley, was forced out of the bare-knuckle ring through injury and set up B-Bad Promotions to fight the corner for the sport and try and introduce better regulation. The great-grandson of legendary fighter GC Joynes, one of the biggest names in the bare-knuckle fraternity in the early 1900's, Andy organised the first title bouts for almost 150 years when he set up his debut event in Hinckley in 2012. Saturday night’s event was planned as B-Bad’s ninth and the second in Hinckley with 18 combatants on a nine match card with two UK title bouts. A bare knuckle boxing match that was due to take place on Saturday has been postponed, police have said. More than 1,000 people were expected to attend the fight at Hinckley United's former ground, in Leicester Road. A Leicestershire Police spokeswoman said the stadium's owners had decided to delay the bout due to "planning and licensing issues". David Tredinnick, Conservative MP for Bosworth, had said the fight was illegal and wanted it to be stopped. The force met the owners of the Greene King Stadium, organisers B-BAD Promotions and the local council, on Wednesday. Chris Thompson, from the Greene King Stadium, said the venue's licence only covered boxing and wrestling events. He said he was advised by the police that the licence could be under threat as the fight might be categorized under the rules of Mixed Martial Arts (MMA). Mixed Martial Arts are a full contact sport where hitting, kicking and grappling techniques are used by competitors. Venues require a different licence should they want to put on a M.M.A. fight. "Had it been bare knuckle boxing [without gloves] we'd have said no straight away," said Mr Thompson. "But we're working with police and we want to do everything correctly." Leicestershire Police said the legality of the sport was a "grey area" but if gloves or wraps were not used then it would be against the law. Andy Topliffe, from B-BAD Promotions, previously said fighters used coverings on their fists. With regard to the postponement, he said: "It's a great shame." However, he said the meeting with officials helped demonstrate that the sport was legitimate and "is not being fought in lanes, fields, or warehouses". A spokesman for the British Boxing Board of Control said: "This event is not licensed or regulated... and we do not approve such events." Andy Topliffe said he wanted to take bare knuckle boxing back to its "grass roots"
the fight at Hinckley United's former ground on Saturday. David Tredinnick, Conservative MP for Bosworth, said the sport was "illegal" and must be stopped. The fight's promoters denied it was against the law and are set to meet with Leicestershire Police. proposed is illegal and anyone associated with it is breaking the law." try and work a way around it [so] that everybody's happy. In the sport, fists are covered with gloves or wraps of no more than 4cm in padding, making the sport legal, he said. man... with bare knuckle it is only two fists." Leicestershire Police said they were due to meet with the fight's organisers on Wednesday afternoon before deciding whether the fight could go ahead. 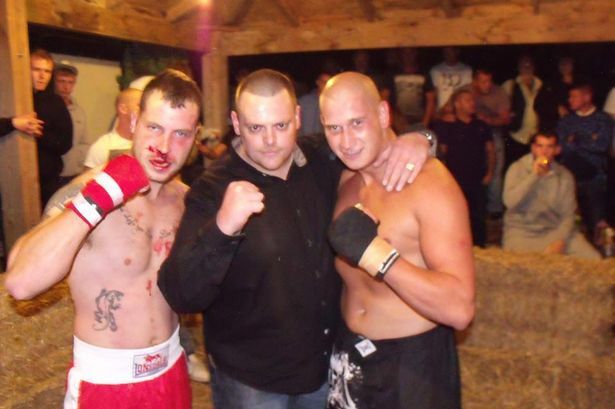 Andy Topliffe said he wanted to take bare knuckle boxing back to its "grassroots"
By day they are builders, property developers and spray-painters. Everyday blokes with everyday jobs. With 300 fans cheering them on, these bare-knuckle boxers are here to batter each other in a real-life Fight Club. A Daily Mirror investigation today reveals how one of the world’s oldest and most brutal sports is on the rise again. In the first fight one bruiser hits his opponent so hard on the head his hand instantly fractures and the bout is over. But unlike the hit Brad Pitt film that put brawling on the silver screen, these bouts are NOT illegal and they DO have rules. There’s a referee to enforce them and a paramedic at the ringside. And though we may be in the back garden of “celebrity gangster” Dave Courtney , there are no snarling pit bulls or gun-toting heavies here. Gambling on the outcome is a no-no while the most underworld “face” in the crowd is ex-Krays enforcer Freddie Foreman, now in his early 80s. The packed crowd are witnessing the first transatlantic championship ‘“BKB” bout for more than 120 years, with pubs taking a pay-per-view video feed. Courtney, an ex-cohort of the Kray twins and East End “guv’nor” Lenny McLean, said: “In the old days, the crowd would have been 90% villains. "Tensions ran high because there was a lot of money at stake and each firm wanted to keep their rep.
"But today it’s all about the glory. Look for yourself – there’s no security, there’s no trouble here. It’s a lot more civilised. Bare-knuckle boxing was never outlawed but with the emergence of the Queensbury Rules and gloved bouts in 1867 it shrank into the back streets to be taken over by villains . Now promoter Andy Topliffe, 37, is working to win it back. A veteran fighter himself, pub landlord Andy launched his crusade to legitimise the sport after saving the life of a Polish fighter left to die by the side of the road. He said: “This guy was in real trouble and the prom­oters just jumped in their car and legged it. "I knew I needed to do something. By removing the illegal money we removed corruption and the welfare of the fighters is paramount. Previous bills have featured soldiers, a solicitor, scaffolders, a PE teacher and factory workers. They take home just £250 for having a go and the organisers say the bulk of the profits from the door and bar go to Cancer Research. Helping to run the show is trainee solicitor Seth Jones, 48, now studying for his legal qualifications. Seth, who has also stepped into the ring, says: “It’s the same as any other martial art. It comes under the ‘dan­ger­ous exhibition’ statute like knife-throw­ing or a magician chopping someone in half. "It’s not gangsters, gypsies or travellers. It’s far from that element. “You get in the pit and fight with bare knuckles but you are gentlemen who agree to the fight beforehand. Legal bare-knuckle boxing is the latest craze attracting celebrities, professionals and even women, who made up around a fifth of the crowd. Film stars Keanu Reeves and Ray Winstone are fans of Andy’s B-Bad Promotions, the Leicestershire based firm behind the venture. But for contenders Tony “Pancho” Caulton and Jacko “Bullet fist” Jackson, it was their first ever BKB fight night. Dad-of-two Tony, 32, a spray-painter, said: “I’m only doing it just so I can say I’ve done it, though I don’t go bragging. "I just want to experience it. If I get knocked out, I get knocked out and that will be that. Jacko, a property developer, added: “I just thought I’d have a crack. See what it’s all about. The night ended in defeat for both, but referee Shaun Smith, 48, paid tribute to all the fighters. “These are lads full of testosterone, alpha-male syndrome, King Kong's,” said the debt collector. "This is something they want to do as an individual, as a man, go out there, bare knuckle and just go for it. The main event saw current champ James “The Gypsy Boy” McCrory, a Geordie, take on US title holder Jason “The Machine Gun” Young. Three rounds later, the Machine Gun was lying face down, out cold from a hefty left hook. After some medical help Young was groggy but back on his feet. And after trading vicious blows for 10 minutes, they shared a beer afterwards. A day later, with his record standing at 132 bare-knuckle wins, he announced his retirement from the ring on his Facebook page. Would he never fight again? “For now and the foreseeable future... No. But never say never...” he added. Andy Topliffe’s B-Bad tour goes to Colwyn Bay in North Wales next month. weight into a wild hook which crashes against his opponent’s skull. Groggy but still in control, the fighter known as The Machine rallies and the two continue to trade ferocious blows. Then comes the savage knockout punch — and The Bull Dog lies on the ground covered in blood. The Machine roars to the baying crowd, brought to their feet around a tiny makeshift ring of hay bales. The fighters had slogged it out for a torturous 11 minutes 36 seconds, raining strikes down on each other in the freezing night air. a Geordie factory worker called Mad Dog minutes earlier. Welcome to the twilight world of Britain’s real-life fight club, where hardmen from all walks of life go toe-to-toe “on the cobbles”. Astonishingly, the events are all LEGAL and above board. And it is coming to a town near you soon — in a bid to make the 200-year-old sport as mainstream as boxing or judo. Legal bare-knuckle boxing is the latest craze attracting celebrities, the middle classes and even women as spectators. Keanu Reeves and Ray Winstone are already big fans of B-Bad Promotions, the Leicestershire-based company behind the venture. B-Bad is trying to clean up the sport and shake off its underworld image, making it safer by having doctors and nurses ringside. Promoter Andy Topliffe, 37, a publican from Hinckley, Leics, said: “Surprisingly, bare-knuckle is much safer than Queensberry Rules (the generally accepted version of modern boxing) because the fights are shorter, typically one to three rounds, as opposed to 12 or 15. “There are 20-second counts instead of ten seconds and fighters can drop to their knee during the bout for a five-second breather. “It looks gruesome but the worst injury we’ve had is a broken nose. “Knockouts are revived quickly by the off-duty NHS nurse, who holds their legs up so the blood rushes to their heads. Before setting up his business, Andy joined forces with legal academics at Bangor University to find out whether the sport was against the law. They found bare-knuckle boxing had never been outlawed fully and was legal unless described as Queensberry Rules and if events didn’t break Trading Standards regulations. A veteran bare-knuckle fighter, Andy launched his crusade to legitimise the sport after saving the life of a Polish fighter who was left to die by the side of the road by unscrupulous promoters. Ultimately, Andy wants B-Bad to form an official board of control so fighters can be licenced, all in the interests of safety. The fights now take place in manicured back gardens — not gypsy campsites or deserted warehouses packed with pit bulls and gangsters. During the last fight, the police turned up to make sure everything was in order. The fighters are paid a flat fee of between £100 and £500 and any profits from ticket sales go to Cancer Research. Prize money and gambling are strictly off limits. Ex-para John “Smasher” Stuart, 31, got into the zone before his fight by sitting in a dark corner and listening to his iPod. After winning the evening’s first bout, the construction worker from Leeds said: “I broke my hand so I’ll need some ice on it when I get home, but it was a good night. Factory worker and part-time fighter Michael “Mad Dog” Ord, 26, said: “Even though I lost my fight to Smasher, I feel great. Saturday’s fights took place in a back garden in a leafy south-London suburb, with a pre-paid token-only bar to discourage drinking. The crowd included IT executives, soldiers, farmers, van drivers, builders and a church pastor. Despite the efforts of B-Bad, bare-knuckle boxing still attracts shady characters. On Saturday notorious ex-gangster Dave Courtney was there with villains and ex-football hooligans. He said: “In the old days the crowd would have been 90 per cent villains. Now we’re in the minority. It’s the most gladiatorial form of combat available for the normal person to go and see — and I’m glad it’s less underground. Bare-knuckle beast James ‘Gypsy Boy’ McCrory upset the odds by defeating veteran Dave Radford to claim the BKB British title. It took the Geordie hard man less than five minutes to see off Radford in the final bout of the Yorkshireman’s career. Lean and mean McCrory caught ‘The Bull’ with some fine shots early on as the two knucklers sized each other up in the tense early exchanges. Radford (43),who was unbeaten in the knuckle game before Saturday night’s clash, gave back as good as he got despite taking some punishing blows to the head. The tough guy from Hemsworth, also known as ‘The Beast’,caught McCrory with two beauties to the temple in only the second minute but the younger man stayed strong and came back at Radford like a man possessed. Another roundhouse to the temple rocked Radford’s head back and the Yorkie’s face was blown up out of all proportion. His eyes swollen beyond measure and cheeks jutting out hideously, Radford’s face was barely recognisable. Then, out of the blue – and for the first time in his career – Radford went down on his knees without another blow being struck. Looking dazed and disorientated, the northern tough man - his eyes so swollen they were almost completely closed he looked up at referee Danny Draper and told him he couldn’t see anything. The 200-plus fight fans held their breath as Radford knelt in front of the hay bales that formed the ‘ring’. Ref Draper asked the stricken fighter if he wanted to carry on and the brave Yorkshire warrior nodded ‘yes’, but as he got back to his feet it was clear that he couldn’t continue and the fight was stopped. McCrory was declared the British BKB champ to a roar of acclaim from his fans. So young and strong, McCrory will take some stopping on the knuckle scene. He was handed the BKB belt by knuckle legend Paddy Monaghan, widely regarded as the best middleweight bare-fist fighter of all time. Radford was gracious in defeat but Radford’s army of fans looked shell-shocked by what they had just seen. They had travelled from West Yorkshire confident that their man would be bringing home the BKB belt as a fitting end to a distinguished career. Nice-guy Radford is highly-respected on the knuckle scene and has won many fans as a cage fighter too. His charity work through boxing culminated in an exhibition fight with the ‘Dark Destroyer’ Nigel Benn in his home town last month.A soon-to-be published book about Radford’s career is a work in progress in conjunction with sports writer Nick Towle. Called ‘Beast’, it recounts the highs and lows of Radford’s career, from going the distance with Roberto Duran, to a serious work accident that practically ended his gloved career, and his re-emergence as a feared Bare Knuckle and cage warrior. The one other knuckle fight at the Leicester show saw Welshman Seth Jones dominate plucky Mat Thorn. Jones sent his opponent to the floor at least six times before the fight was stopped. The show was filmed by Cage Amateurs UK for a new DVD which is about to be released. Called ‘B-BAD Promotions’, the DVD will show footage of Saturday’s fights plus interviews with the boxers. Bare Knuckle King Monaghan, who was undefeated in 114 bouts during his career, is also interviewed before the fights.